A water storage tank to supply the domestic services of the main stand, suitable for the external location. Hot press sectional tank with externally flanged sides and base and base leveling steels. York Racecourse is a venue in York, North Yorkshire in England. York is one of the Premier tracks in Europe having recently won the Flat Racecourse of the Year Award and also came out top in The Times newspaper survey of all Britain’s racecourses. It is currently the third largest racecourse in Britain in terms of total prize money offered. It attracts an estimated 350,000 people per year and holds three British Group One Races. Our client required a water storage tank that was going to be sited outside the main racecourse, the water storage tank was required to supply the main stand amenities including all domestic services. The existing tank no longer suited their current requirements and after discussion with our expert sales team upgrade works to the existing configuration were not possible. A new tank gave our client the opportunity to increase the water capacity required to the building due to low water levels on race days. 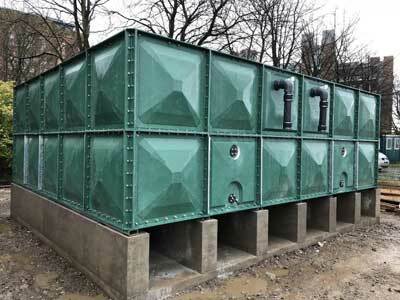 We looked at various size options with the consultant, who was working on behalf of the client and after much deliberation our client agreed the best solution for capacity requirements and available space was to construct a tank measuring 6m x 5m x 2m which would hold a capacity of 60,000 litres. As it would be situated between buildings and trees the client requested something that would less conspicuous that would blend in with the surroundings of the racecourse. Our sales team recommended manufacturing the panels in BS 14-C-39 green to disguise the tank into the backdrop of the course. All our tanks can be manufactured to any BS or Ral colour on request.